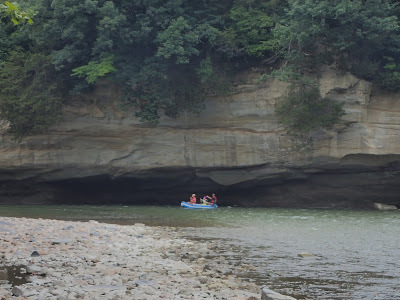 The Vermillion River, near the Ottawa Area, is the best place for river rafting near the Chicago area. We finally made it out to here on a lovely weekend and will likely make this a summer tradition. Its funny to think that the same town my mother grew up in is becoming our premier destination for outdoor adventures near Chicagoland. 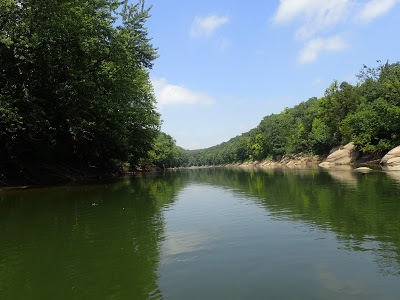 Ottawa-Utica-Peru-Oglesby area has long been a favorite for outdoor enthusiasts in Northern Illinois due to the picturesque Fox and Illinois Rivers along with the iconic Starved Rock State Park. 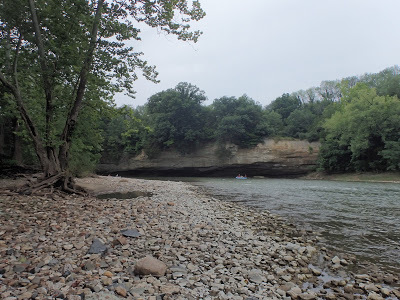 The more intrepid locals of the area tend to actually favor Matthiessen state park and the Vermillion River over anything else. We found the area to be an extraordinary example of Midwestern environment. 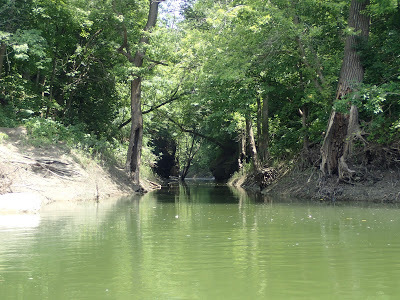 The Vermillion River is one of Illinois more wild rivers. 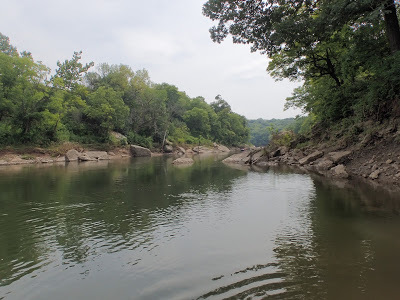 Although the Mississippi, Illinois, Fox and Des Plains Rivers are much more well known, the Vermillion retains most of its rugged character. Hence, its a favorite for river rafting. 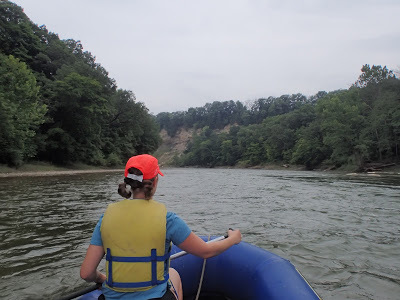 One might think that a flat state like Illinois is hardly a destination for rafting. 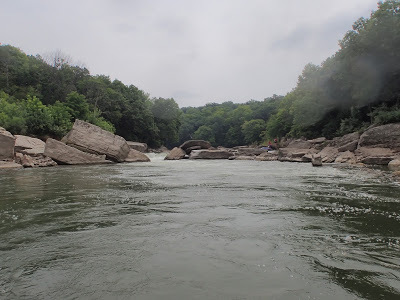 However, this delightful river offers just the right balance of rapids to pleasant floating. It was a great way to spend a simmering summer Saturday. 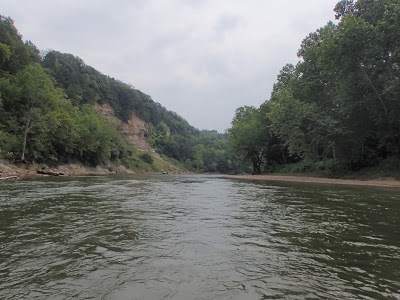 We were able to easily rent a boat from Vermillion River Rafting. As you can see, the river is full of twists and curves. I could brake it down into about three sections. The first third is mostly moving water without significant rapids. Its cliffy and magnificent. 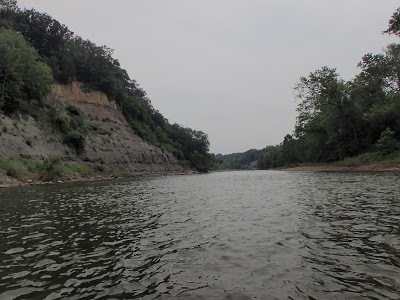 The second third continues with sharp cliffs that make the river seem like a deep Southwestern-like canyon. Here's where most of the rapids are, including Wildcat Falls. Wildcat can actually swell to a surprisingly good Class III rapids in the spring and after heavy rains. Even in a dry summer, it can be an adventurous and tricky section to navigate. None the less, it adds a thrilling challenge to the trip. The second two rapids are also thrilling but not quite as technical. The final third is a relaxed float which is best taken as slowly as your day allows. As it was just the two of us, we were somewhat jostled by the stronger rapids. I think a perfect group size would be 3-4 which would be enough weight to keep the boat running steady but not too much to drag through the shallower sections. Nevertheless, we had a great time although occasionally embarrassing ourselves as we went completely backwards through some of the easier sections. Paddling as a couple through rapids could be considered a "couples skill building" activity. Looking back on Wildcat Falls which ultimately soaked our boat! Getting soaked wasn't exactly a bad thing on a hot summer day. We pulled over a few times to bail out the boat but there were so many nice landings that it made for a full day paddle. The dam and the concrete factory were the only visages of civilization we had on the whole trip. There were a few presumably abandoned railroad bridges but that added to the allure of the trip. After getting through the three main rapids, we enjoyed a pleasant float all the way back to the landing. I imagine this will be a trip we do many times. Perhaps we'll rent funyaks next time?